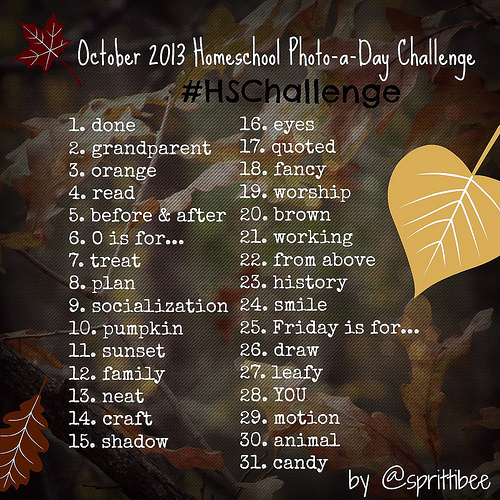 Back by popular demand… the Homeschool Instagram Photo-a-Day Challenge is going to continue! This month we’re aiming to capture little memories from October 2013. I’m loving seeing your finished collages on your blogs! If you are interested in making a collage with your photos, you can always check out Big Huge Labs. They link to your Flickr account (and Instagram allows you to save your photos to Flickr instantly as you publish them). That’s how I do it! * If you want to join the fun and challenge yourself to take a photo a day this October, share this post’s url/link and the image above on your blog, Twitter, Pinterest, Facebook Page, and IG account. The more homeschoolers the better! Take a photo along the lines of the theme each day and share them inside the Instagram App. Use the #HSchallenge hashtag in your subject line so your picture will go in to the group pool so we can all browse them. Easy peasy! For example: Day 1 (October 1st) was “Done”. I’m getting this up a little late, but you can take a photo of something you completed/finished or something cooked well-done. Be creative. You can write on your images, too (there are a lot of text apps out there – my fave is Phonto). I never got around to showcasing your photos on my blog last month – WHEW!! was September BUSY! So sorry. I’ll try to do better this month. I barely finished last month’s challenge myself. I got a little behind mid-way and had to catch up in the last week of September. That’s ok. Don’t stress! Go at your own pace.